Amid the recipes for holiday cookies and cakes galore, I figured you might be interested in some real food. Not that I don’t consider desserts to be real food, but occasionally I take a break from sugar to eat some cheese. In this case, I accompanied the cheese with pasta and sauce, which is not totally mandatory. In August we drove to Oregon for a week and a half to visit with both of our families, and enjoy the most wonderful state EVER, and then drove back to Montana with a carload of stuff from my Mama’s house. Among these goodies were high school memories, forgotten clothes, and a PASTA MAKER! Exciting, yes. Have I used it much? No. But this is all changing, now that I’ve crossed the frontier into pasta-making for the first time. Ravioli might seem somewhat daunting, since there is a little bit of labor involved, but in the end it was surprisingly easy and delicious. 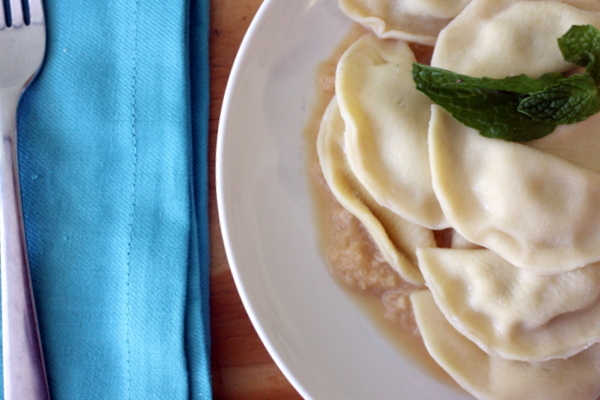 I was tempted to make a butternut squash ravioli, as I love them and they seem to be oh-so-popular, but I’ve read many a blog post recently on how to make them. Darn. Next option: cheese. Soft, smelly, delicious cheese. I found this Blue Cheese Ravioli Recipe on Bon Appétit and decided I’d give it a go, branch out and live a little! It was worth it – evidenced by my making this recipe three times to get it right. Yep. Real life struggles. Who knew semolina came in different sizes? You do now! Due to lack of proper semolina, I went with the original recipe with all-purpose flour. Creamy with a delicious onion tang, these ravioli make a quick, delicious dinner any night of the week. For the sauce, melt 3 Tbsp butter in a pan, then add onions and cook until translucent, but not brown. Add the broth and simmer until onions are soft (about 10 minutes). Puree onions until smooth, return to a small saucepan, add 1 tablespoon of butter and broth to make the consistency you want. Cover and chill until ready to serve. For the dough, mix flour and salt in a large bowl and make a well in the center. Add eggs, yolks, 1 tablespoon water to the well. Using a fork, beat the liquid in the well while gradually incorporating the flour. When the dough is together and sticky, turn it out onto a floured surface and knead until smooth – about 10 minutes. Gather dough into a ball, cover, and let rest at room temperature for one hour. For the filling, cook the butter in a small saucepan over medium heat until brown (about 3 minutes). Pour into a mixing bowl and allow to cool before mixing in ricotta, blue cheese, Parmesan, salt, pepper, and egg yolk. Mix to combine. Divide dough into 4 equal pieces. Leave 3 pieces covered. Set your pasta machine on the widest setting and roll one flattened piece of dough through. Fold in half and run through again. Continue to pass the dough through each setting until you are on the thinnest setting. Cut dough into your desired shapes (I used a biscuit cutter and just folded them in half). 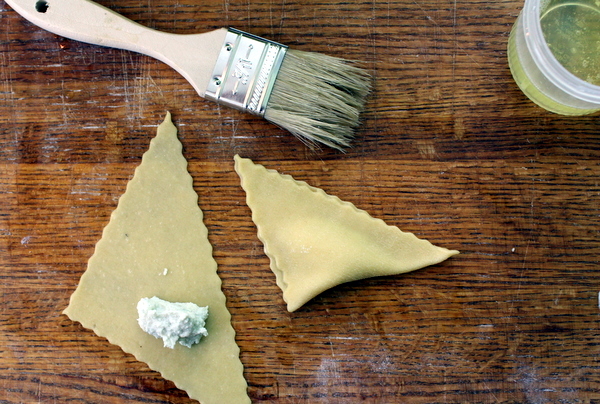 Lightly brush any side that will be on the inside of the ravioli with egg white. Drop 1 teaspoon of filling in the middle of your ravioli, fold over (or cover with another piece) and press the edges to seal the seam. Repeat until you have made all the ravioli you can! Place the raviolis on parchment paper. 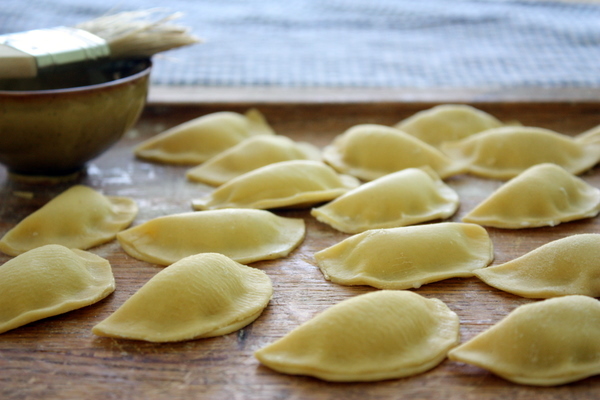 Cooking in two batches, drop raviolis into boiling water and cook until tender – less than 5 minutes. 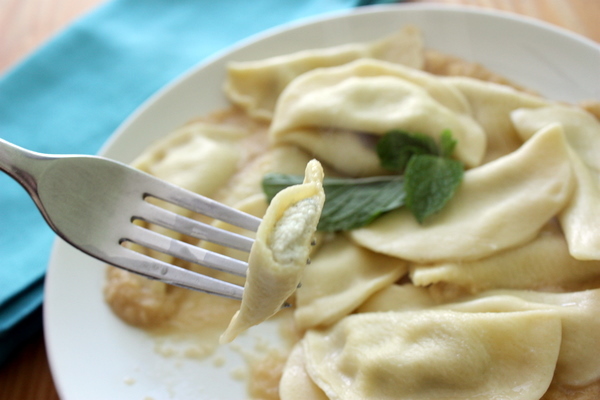 Using a slotted spoon, transfer the ravioli to a large bowl and drizzle with olive oil to coat. Warm the sauce, drizzle onto each plate, top with ravioli and garnish. As you are rolling out the dough, keep it covered or it will dry out when you’re doing the rest of it. Play around with shapes – I made some triangular ones, some circular, some half moon. Crack some fresh pepper on this – it’s delicious!